The 357 Magnum has a fantastic reputation for stopping power, and due to that stopping power, this round makes for an incredible self defense cartridge. 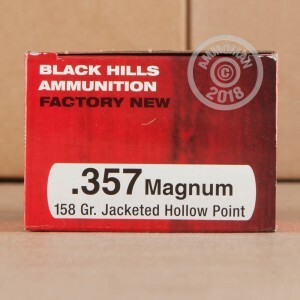 Invented in 1934, the 357 Magnum started the release of many other magnum cartridges, beginning a new age where high powered rounds were not hard to come by. As a company that the US Military buys match grade ammunition from, Black Hills provides some of the most accurate ammunition on the market. 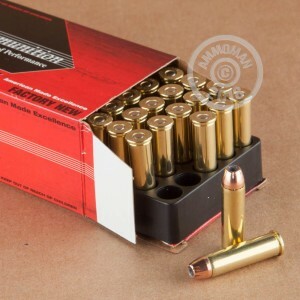 These 158 grain jacketed hollow point rounds will have no trouble stopping your attacker by providing controlled expansion and consistent penetration. 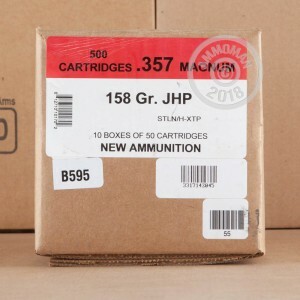 Each round in this box of 50 is loaded into a boxer primed brass case that is re-loadable. Do you need more than 50 round? At AmmoMan.com all orders over $99 will ship for FREE!